Poufs and ottomans have been around for a very long time, as many cultures prefer low seating for meals and family gatherings. 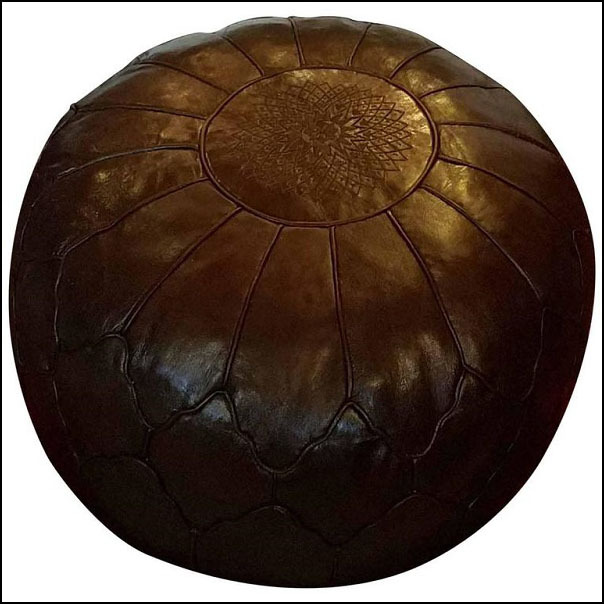 We, at Living Morocco, carry a wide variety of leather poufs and ottomans, fabric hassocks and leather camel saddles. This extra large pouf is one of a few we currently have in stock. Being oversize makes it unique and 1 of a kind. Measures: Diameter is 27″ and height is 15″. Color is dark chocolate brown. Made of fine quality leather. Also available is snow white, bright orange and saffron yellow. Please contact us for a shipping quote, if you have any question or for more pictures.